The key to effective rehabilitation, injury prevention and improvement in posture is a properly designed exercise program specific to the level of the individual and frequent progression of those exercises. 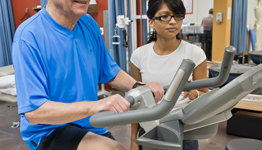 During the rehabilitative process there’s an exercise prescription for you. Your highly trained therapist will accurately assess what stage of strength and flexibility you are at and design a program specifically for you. This program includes pictures, videos, and specific instructions to make it easy for you to exercise away! Our therapists have worked with olympic athletes, professional sports figures, musicians and to concussion and stroke patients, from the young to the elderly. Surprisingly, all require the same approach to the therapy. The goal is to maximize posture and movement efficiency. This requires flexibility, strength, neural coordination and an integrated nervous system including ones’ vision and autonomic nervous system-regulated blood supply and hormone delivery. All of these can be effectively influenced by your therapist at PhysioActive. From simple postoperative rehabilitation to elite sports performance, to the simple tasks of daily life your therapist and you can work together to provide an exercise program designed to reach your goals.